Shut off from the world for decades and untouched by mass tourism, Burma is one of the most unspoilt and wild of all the countries in continental Asia. Though the country has been open to tourism now for several years, there are so many regions that are yet to be explored – so many new possibilities opening up year on year. Burma is in the throes of great change, and that makes it an incredibly exciting place to explore. 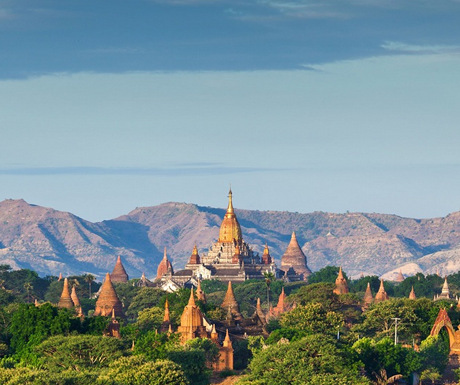 The following destinations are a few of our favourite hiking spots in Burma, but we can’t wait to discover even more. Massive Inle Lake, covering 120 sq km and ringed by the Shan Hills, is one of the most popular tourist destinations in Burma – and for good reason. In this wonderfully picturesque spot, the local Intha people live in stilt villages on the water, grow their food in floating farms, and get around by boat – using a distinctive one-legged rowing technique unique to Inle. Though the lake itself is the focal point of tourism to the region, the surrounding hills make for some excellent hiking opportunities. Our favourite route takes you away from the lakeshore, through the town of Nanpan and into the bamboo forests and farming villages of rural Shan State. Spend the night in a Pa’O minority village, Hti Ne, before returning to the lake. In the far east of Burma is Kengtung – formerly the centre of a powerful kingdom with trade links to China and Siam (now Thailand). Thanks to Burma’s long military isolation, however, Kengtung lost its importance and faded into obscurity. Now, it’s a relatively unknown town surrounded by beautiful countryside and dotted with tribal villages – home to the Akha, Wa, Enn and various other ethnic minorities. Only accessible to travellers by plane, Putao lies in the far north of Burma – right up in the foothills of the Himalayas. Due to internal conflicts in Kachin State, this region was off-limits for many years, meaning that its thick forests and countryside have barely been touched by tourism, offering some amazing opportunities to get off the beaten path. Covering 1.5 million square kilometres, Shan State is vast – and it’s home to three of the five destinations on this list. Hsipaw, in the north of the state, is the third, and a fantastic base for hikers wishing to explore the surrounding countryside. This region is home to Palaung and Shan ethnic minority villages, which lie hidden throughout the hills, and is accessed by a very dramatic train ride over the Goteik Viaduct from Pyin Oo Lwin – a former British hill station. A relatively unremarkable rural town, Kanpetlet lies on the doorstep of Mount Victoria National Park, making it a superb starting point for hiking in Burma’s western region. Mount Victoria itself stands at 3,035 metres tall – the highest in Chin State – and the surrounding national park is one of the country’s very best trekking locations, with routes to suit walkers of all stripes. The picture of Inle Lake is really impressive and I love the happy people of Putao. Burma seems like such an interesting place. Great information you gather! Burma has a nice place we would love to learn more about this place. Thanks. Gosh, this looks so different. Yes as mentioned by Neni the photo of the Inle Lake is amazing. Thanks for sharing this information with us.